Majority of the time I don't wear makeup. My mom rarely wore it and it seems I have followed suit. As I age though my skin is getting a bit redder and uneven. I probably shouldn't have waited to take care of it so long, but alas I can't go back to my tanning bed loving high school self and tell her how bad of an idea that is. By no means am I perfect when it comes to using all non toxic and clean products, but I try. One area I have gotten it down though is in my skin and makeup choices. Another must was for the process to be quick, easy and look natural. My desire is never to change the way I look, but just clean it up a bit. I finally have found products I love and achieve the results I desire in just a few minutes. My skin is sensitive, breaks out easily on the chin and at the same time is very dry in the cheek area. For years I didn't find the value in buying "good" makeup and drugstore finds left my skin broken out. I finally bit the bullet and decided my skin was worth the investment and my minimal wardrobe helps balance the budget a bit. 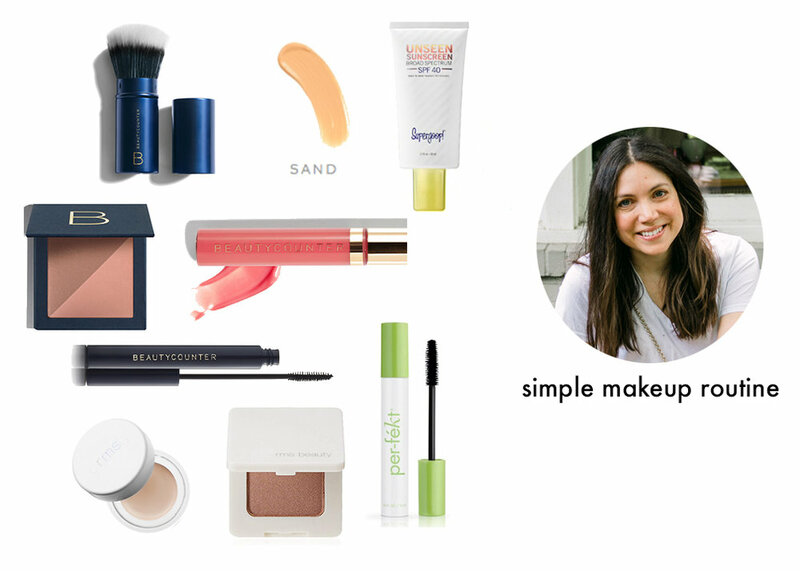 All my basics come from Beautycounter, but I have a few more favorites from other sources that I will share. I bought the Beautycounter flawless in five minutes kit to start as I was a little makeup illiterate and majorly intimidated on where to start. The kit made it simple. The combo comes at a discount, but after trying it I could probably do without the concealer and the brow pencil as those are steps that I normally find myself skipping. My process is pretty straightforward and takes no time at all. It also doesn't change from day to night. The only way I jazz it up is to layer it on a bit more. Again, I like it simple and minimal. 1. If I know I will be in the sun I start with Supergoop sunscreen. Being oil free helps with breakouts and it works well with helping makeup stay put. Some days I just wear the supergoop, because protection is key. The velvet finish feels oh so good. 2. I then use this brush to put on this skin tint. I wear sand as I have a natural slight tan with a yellow undertone. I don't add it to my forehead as I feel makeup accentuates those lines and my skin is still pretty even in that area. That means I just use enough to even things out. I know am late to the game, but I now swear by using a brush to apply foundation. It makes it all so much more natural looking and I can control the amount so much easier. 3. This blush/bronzer, in tawny/whisper, combo adds just enough color to my cheeks. 4. If I have a spot to cover I use this concealer in light and I sometimes use it to cover spots when I'm not wearing any other makeup. It does the trick, but is not a go to for me. 5. If I am being fancy then I will use the brow pencil in dark, but my eyebrows are already pretty intense so that's a very rare occasion. I have used it as an eyeliner though for a wedding I attended and it worked well. 6. This eyeshadow by RMS organics can be applied lightly for daytime or add more for a dramatic look. My favorite is Tempting Touch. It's just enough color to accentuate without looking too made up. 7. Now to my all time favorite. RMS magic luminizer holds true to the magic it claims to encompass. I use it just below my eyebrow arch and my upper cheek bones. Sometimes I use a dot of it in the middle of my eyelid in lieu of eyeshadow. It adds a slight glow that makes my dulling skin come alive. The slight champagne color works well with my skin tone, but they also have a colorless one that would be better for the more fair skinned. 8. When I am in a hurry and think I need a quick pick me up for some tired eyes then mascara is my go to. I choose the lengthening mascara that came with the flawless in five minutes kit, but wouldn't mind trying the volumizing too as it's their best seller. My go to mascara for years now though is per-fekt in flash. Still not ready to give it up as of yet, but we shall see. 9. My final touch when I feel I want more than basic chapstick is to use the Beautycounter lip gloss in peony. Just enough color, but still looks natural enough for everyday use. What are your makeup go-to's? Any favorites you can't do without? I know makeup and skincare is such a personal thing as everyone is made so perfectly different. These just so happen to be the key for me after years of trial and error. this time around I am trying the new purifying mask as I ran out of the resurfacing mask. Hoping I love it just as much! Shop HERE and be sure to use the birthday code BDAYBEAUTY through July 30th. As I've said I wait all year for this very sale.